Sustainable Harvest’s inclusive business model is called Relationship Coffee™. While many companies today operate on a series of short-term, profit-driven decisions, Relationship Coffee transforms the way business is done by building long-term relationships based on transparency and trust. We create market access and traceable supply chains for smallholder farmers, and involve our suppliers in negotiations with the final buyer, helping the farmers become empowered, informed actors in the coffee supply chain. By shifting the paradigm from closed, one-off transactions to an open and collaborative supply chain, we have seen Relationship Coffee strengthen the specialty coffee industry and help all stakeholders thrive in their businesses. Sustainable Harvest Coffee Importers is a US-based importer of specialty coffee and leading social enterprise with headquarters in Portland, Oregon. 93% of our coffee is certified either fair trade or organic, and all of it is of the specialty coffee grade which brings coffee producers higher prices than coffee’s “C’ market prices. In 2011, our revenue was $78 million, which represents an average growth rate of 41% since our founding in 1997. We now import 1 out of every 5 bags of fair trade, organic coffee into the US. Sustainable Harvest has six offices worldwide, five of which are located in the coffee-producing countries of Colombia, Peru, Mexico, and Tanzania. With an international staff of 40, we are constantly on the ground in coffee communities, creating relationships and connecting all the stakeholders, from grower to roaster, in lines of open communication. Our five ‘origin offices’ also facilitate a wide variety of training programs which constitute our long-term investment in the coffee communities from whom we source. In 2011, we dedicated one-third of the company’s annual earnings to programs and services for our current and potential suppliers--increasing the number of small-scale producers who can successfully export their product to an international customer, and ensuring a healthy future for everyone involved in the specialty coffee industry. I will always remember the day I discovered my life's work, and developed the idea of Relationship Coffee. I was working in Mexico in the 1980s as a volunteer for the National Coordinating Body for Farmer Cooperatives. At that time, many of the twenty million coffee farmers around the world were at the mercy of middlemen who paid farmers little for their product. The short-sighted, profit-driven business ‘norm’ left farmers in a cycle of poverty. Moreover, changes in international trade regulations had sent coffee prices plummeting, and the farmers had little knowledge or bargaining power with which to preserve their meager livelihoods. That day when I was sitting at my desk those many years ago, an eager, serious farmer named Pedro came to see me. On behalf of his entire village, he asked me to help him sell his coffee, and thrust a bag of coffee into my hands. Looking down, I realized the coffee Pedro was offering was not in a state suitable for export; it still had the parchment, or hull, wrapped around the green coffee bean. Nobody had ever explained to Pedro how to prepare his product for sale on an international market. Looking at Pedro, I felt the enormity of the challenge he faced. Not only did farmers like him need access to markets that would pay them a fair price for their coffee; they also needed training and education to understand and succeed in the global export and sale of their coffee, and a consistent, long-term business partner to bring stability to their communities. And Pedro was just one farmer who happened to come to my office; there were millions of other men and women like Pedro, in Mexico and the other coffee-growing countries around the world, who depended on coffee for their livelihood but had no idea how to access the major markets. That was 20 years ago. I immediately began working to form a new kind of business, a coffee company that could bring together everyone in the supply chain and reinvest its earnings to provide training and education to farmers like Pedro, empowering them as players in the market and business partners in the supply chain. Sustainable Harvest’s business relationships would be entirely transparent, providing benefit to all involved and ultimately helping farmers move from subsistence to sustainability. Instead of being one link in a complicated, opaque supply chain, we would be the connecting force that would bring all of the actors together, for the shared benefit of everyone. Our key innovations have been to infuse transparency into all aspects of our business, to reinvest heavily into our supply chain, and to host an event every year that brings together the entire supply chain for ultimate transparency and relationship building, called Let’s Talk Coffee®. Transparency has been a guiding principle for Sustainable Harvest from the beginning. It might not be the traditional way of importing commodities, but transparency creates indispensable shared value throughout our supply chain. Producers are empowered to increase their competitiveness and earn higher incomes; roasters are assured a traceable, quality cup of coffee for their customers. In 2002, Sustainable Harvest opened our first office at origin in Oaxaca, Mexico. A space for roasters and growers to meet, attend trainings, and conduct business, our offices are pivotal in maintaining the transparency that is a pillar of our business model. The incredible advantage that the Mexico office gave us in communicating and working with coffee communities led us to open 5 more offices over the course of the next few years, in Colombia, Mexico, Tanzania, and Peru. We negotiate our coffee contracts with all parties present, so that the prices and margins, including our own, are understood by both the grower and the roaster. That way, all parties can determine for themselves if the price is worth the value of the capacity building services, quality, and market access that we provide as an importer. One of the ways that we have worked to bring transparency to a traditionally segmented and anonymous supply is to develop an in-house traceability technology program called the Relationship Information Tracking System (RITS). A cloud-based information system, RITS allows co-ops track farm level data and roasters to access inventory and coffee quality metrics as well as key information about their suppliers. It provides us with an invaluable database of historical facts that we can draw upon in our transparent conversations with stakeholders. Moreover, metrics are the key to assessing our impact, and the driver for determining what the supply chain needs to be even stronger. In countries where transparency in business is rare, a shift in the dynamic can have a huge impact. At a training event in Tanzania in 2010, we presented our business model to a room of farmers, coop leaders, and roasters. Part of the discussion involved a breakdown of the price of a roasted pound of fair trade coffee sold to a consumer--out of the $15, how many cents go to the farmer, the importer, the roaster, and the retailer? After the presentation, one farmer in the crowd stood up. Never before, he said, had anyone explained to them what the prices mean, and what their role is in the larger part of the supply chain. As he thanked us for being so candid, he revealed the business sense for transparency: it brings loyalty and trust to the supply chain, humanizing our business and instilling lasting change. Only by reinvesting in the communities that we work with can we ensure the long term success of our own business as well as the sustainability of the communities that supply us our coffee. Therefore, we integrate our coffee sourcing and importing activities with farmer capacity building and community development. In 2011, we invested nearly one-third of our annual earnings in training programs and services for our suppliers. 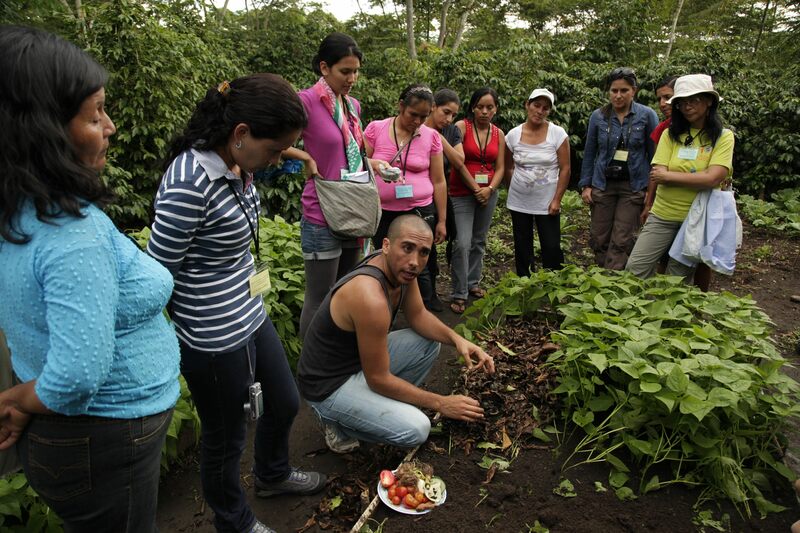 These programs include workshops on how to evaluate coffee quality, produce organic fertilizer, diversify income, manage cash flows, and increase food security. Our stable presence in coffee communities helps us know what initiatives will be the most lasting, effective ways to create sustainable change. The depth of our relationships with coffee co-ops empowers them to actively engage with us and play a leading part in the development of these projects. Over the years Sustainable Harvest has been producing innovative solutions to bring technology further into the field, including an iPad application called RITS Ed that houses a library of educational videos for farmers to access, covering everything from best practices in coffee harvesting to coffee quality analysis. 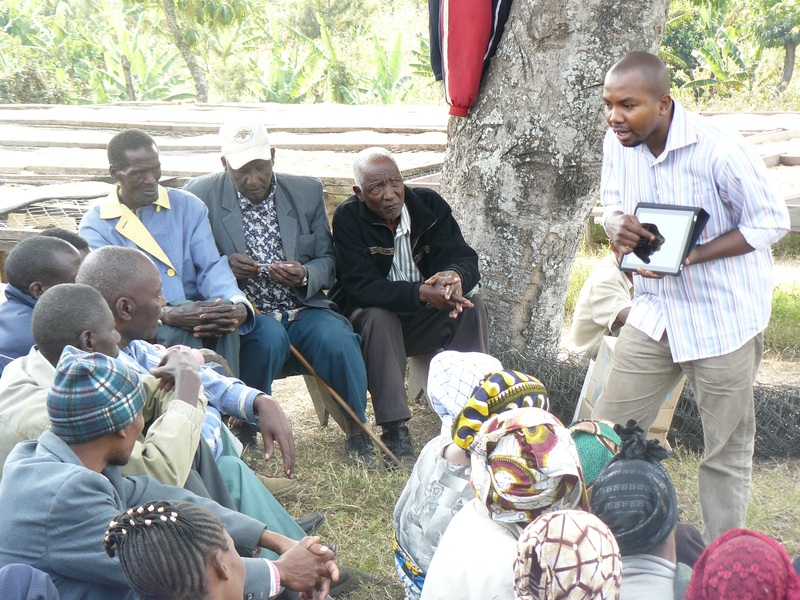 In 2011, we brought the iPad to farms in Tanzania and gave farmers a short training on how to use the mobile, interactive tool. The very next day, one of the trainees, a formidable farmer named Mama Grace, returned having already produced her very own training video on the iPad--she had recorded herself giving a lesson on keeping bugs and pests away from coffee plants, and how to best harvest coffee off the plant to achieve the highest quality. Mama Grace’s enthusiasm showed us how much farmers stand to gain from access to the powerful tools that we use every day as a business in the United States, and how far an investment can go into reinforcing the strength of our coffee supply chain. The Relationship Coffee model can be seen in action at our annual event called Let’s Talk Coffee. Every year since 2002, we have gathered everyone in our supply chain to meet face-to-face. It’s the culmination of our daily work towards total transparency—everybody is invited to express what they value and what they need. Let’s Talk Coffee 2011 gathered 365 people from 22 countries, making it the largest private supply chain meeting in the world. Over the years we have expanded the event to include a broad group of players—joining the producers, agronomists, co-op leaders, and coffee roasters that make up our supply chain are local and international banks that provide farmers with credit, technology companies, and international development organizations. Let’s Talk Coffee is a time for members of the entire supply chain to address challenges together, and have their questions and concerns addressed. Representing the biggest expense on our books every year, Let’s Talk Coffee is a huge investment that we make because of the value it provides to everyone in our supply chain. This year, for example, Fair Trade USA’s recent decision to split from Fair Trade International caused farmers, importers, and roasters alike to wonder how the shift will affect their market. So, we invited the leaders of the Fair Trade movement—Fair Trade USA, Fair Trade International, as well as the Network of Latin American Coffee Cooperatives—to join in a discussion at Let’s Talk Coffee. It was the first time the leaders addressed the split together, and the first time farmers affected by the change had their questions addressed. When issues like this arise, shying away from them is only a short-term fix--we need to engage in them together if we are going to make any progress. We might not have come to any concrete solutions that day, but at least we took advantage of the power of hundreds of the best minds in the supply chain addressing the most pressing issue, together, face to face. While a traditional importer might hesitate to introduce all of its partners to each other, we have found that the open and collaborative relationships that start at Let’s Talk Coffee have made exponentially more impact in supporting specialty coffee growers than each player has working alone. At Let’s Talk Coffee 2008, Lenin Tocto, the dedicated manager of the small Chirinos Cooperative in northern Peru, had the unique chance to meet a Colombian fertilizer expert named Edgar Blandon. Lenin and Edgar spoke at Let’s Talk Coffee about how the farmers of Chirinos were facing ever-depleting nutrients in their soil and increasing fertilizer costs. Out of this conversation, Edgar agreed to travel to Chirinos and teach the co-op how to build and operate an organic fertilizer plant. Green Mountain Coffee Roasters, who buys Chirinos’ coffee and was also at the event in 2008, agreed to fund the project. Now, Chirinos’ fertilizer plant uses readily available inputs in an efficient manner to provide cheap, rich, organic fertilizer to its co-op members. It is a huge success for the co-op and its members, and is also a testament to the power of the Let’s Talk Coffee model to create change in coffee communities. Let’s Talk Coffee is a powerful time of year for Sustainable Harvest staff and for many of our partners. A business relationship between a coffee roaster and a grower changes after a night of dancing salsa together, after 10 years of sharing photos of each other’s children, watching them grow. These are things that no amount of phone calls and faxes can replace, and they have a real, palpable value that remains long after everyone has packed their bags and headed home. People become quicker to pick up the phone when issues arise, and quicker to respond. Business is humanized, and everyone involved begins to think with the long term in mind. After spending years building relationships, Sustainable Harvest and our partners will fight to maintain them. As Sustainable Harvest works to shift the the business norm from short-term to long-term, from competition to collaboration, we have had to overcome the an industry’s fear of the transparency and trust that are the core of our business model. How do we make sure that all of the stakeholders, from farmer to roaster and beyond, understand the Relationship Coffee model and why it is beneficial for them and the industry as a whole? While this remains a challenge that we face every day, we have consistently found that the best tool is simply persistence in open, transparent conversations. There arise situations where the instinct is to hide, retreat, to first talk to one ‘side’ and then the other. What Sustainable Harvest strives to do is to overcome this gut reaction. We are famous for our three-(or more)-way phone calls and meetings that bring all parties involved together to discuss issues openly. We tackle challenges head on, and often go out to meet them, knowing that complete honesty is what is expected of us from all of our partners. The outcome is always worth the tough conversations, or the lunch tab for a face-to-face meeting. Simply walking the talk, time after time, has helped us get through difficult situations and proven to many of our partners the power of the Relationship model. When I’m faced with a challenge, I always ask myself who I can bring into the discussion to help me come up with a solution. What can we do collectively that Sustainable Harvest can’t do alone? 2011 was marked by extreme price volatility in the market, and every coffee cooperative I spoke to was feeling pressed. 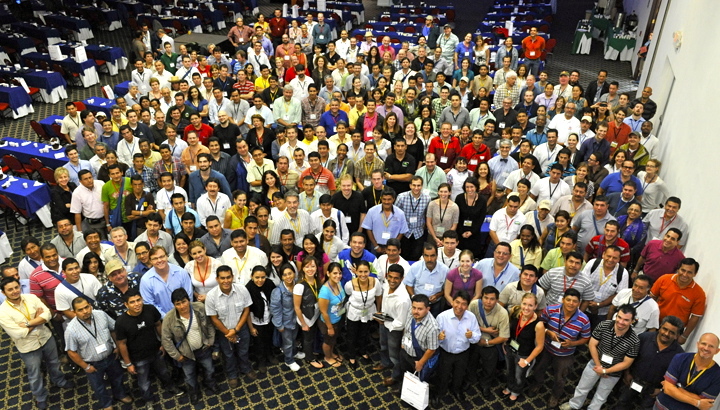 After speaking to Sustainable Harvest’s network of finance organizations, international NGOs, and coffee roasters, we leveraged our shared expertise to facilitate introductory and advanced financial risk management courses for 50 cooperative managers in Peru, Tanzania, and El Salvador, strengthening our supply chain when the global market was stressed the most. Over the years we have found that being a flexible and dynamic company is key to overcoming the challenges we face, and we work to remain this way so that we can adapt the further trials we are sure to meet as we continue to grow. Part of this has been to round out an incredibly capable staff--Sustainable Harvest’s IT team, for example, can speak about coffee taste profiles and food security in rural communities just as well as they can speak about our latest iPad app. This helps us create the great relationships--whether they are with a small-town coffee roaster, an agronomist from Bolivia, or the head of an international development firm--that are the core of our business model and our success. The internal atmosphere of our company mirrors how how we navigate and interact with our industry--decisions aren’t mandated from the top down but are decided transparently and interdependently, with the ultimate goal of creating shared value for everyone. This dynamic energy is palpable in each of our offices. Every day, staff are joining the brainstorms we have about the direction of our company and the future of the specialty coffee industry, and we constantly have new and old acquaintances joining us for coffee and discussion. In the summer we invite thought leaders from the community to come have lunch with us and tell us about their jobs and career paths. These lunch guests often have nothing to do with coffee, but all of our staff can benefit from an hour or two with a carbon-offset trader, a hazelnut farmer, or the head of a local grocery store. Each lesson that we learn can help us to be a stronger company as we navigate the daily ups and downs of the industry we are in. Sustainable Harvest has increased its revenue 41% annually since I founded the company in 1997. Every year since 2008, we have been listed in Inc. Magazine’s ranking of the 5000 fastest growing companies in the U.S. I see our growth as proof that the Relationship Coffee model is a viable way to conduct the coffee trade. While short-sighted business decisions might bring immediate growth to the bottom line, long-term decisions are the key to sustained growth. Moreover, it proves that a non-traditional business model that reinvests its profits into its supply chain can be a sustainable and effective. Our growth year after year has allowed us to bring our business model to more communities and have a greater impact. Since its founding, Sustainable Harvest has channeled over $250 million in income to rural coffee farming communities. Last year alone, Sustainable Harvest paid farmer associations a total of $73.3 million, paying farmers a price $0.65 above the average annual C market price. As our business grows, we can use more money to implement projects in farming communities. In 2011, Sustainable Harvest channeled nearly $2 million in services to farmers. We have trained over 2,000 farmers in the areas of agronomy, coffee processing, coffee quality evaluation, risk management, and more. As a result, more farmers worldwide are gaining the skills they need to earn a living producing and selling coffee. Our Relationship Coffee trade model adds value for all stakeholders in the supply chain and offers a transparent trade model with long-term sustainability for any kind of international commodities trade. I think that other sectors and markets can learn from the effective integration of long-term, private sector investment in capacity building. Sustainable Harvest has demonstrated effective collaboration with non-profit organizations and government entities, showing that an ecosystem of actors, including those in the private sector, can be effective in spurring economic development in rural, agricultural communities in Latin America and East Africa. Our success has proved that a business with a social mission can, in fact, be profitable; our business presence in communities often makes our capacity building programs more effective than a traditional development organization or non-profit. Our model also sets a standard for traceability in the coffee industry, which has one of the most traceable supply chains in the world. Other food industries can learn from our systematic approach to direct relationships and traceable sourcing as a manner to address food safety concerns that are increasingly prevalent in today’s international supply chains. I have been approached by members of the cocoa and tea industries searching for assistance in establishing more traceable supplies of sustainable, certified coffee for the major chocolate makers of the world. This interest in our model shows that the business norm is changing—creating benefit not only for the farmer, but for entire communities. One of the most important lessons we have learned as a social enterprise is that our business model should apply both externally and internally. As such, we make sure to operate with transparency and trust among all of our employees among all offices. We are a certified B corporation, meaning that we have a third party certify the integrity of our internal operations for their environmental and social impact. As a B corporation, we live up to standards of conducting business that are more stringent than traditional corporate models. We have learned that fostering and encouraging a company culture of transparency and trust is essential in the ongoing passion of our employees and the success of our mission. Ultimately, though, what the Relationship Coffee model has taught me is the power of the human side of business to instigate long-term change. The transparent, honest relationships that Sustainable Harvest has fostered over the years are the force behind our long-term capitalistic approach--they are the reason we invest in our supply chain and fight every day to break the traditional model of short-term, one-off transactions. Having gotten to know our supply chain the way we have, how could we do it differently? So the lessons are this: build trust with communication, meet face-to-face, and don’t shy away from dialogue. These steps to create the atmosphere that allows long-term capitalism to thrive. Creating a sustainable and traceable supply chain for small farmers can really help a lot when it comes to the operation of the coffee business. Having this kind of supply chain will make the business to be more efficient and effective. Also, helping the farmers is good because they are the one who harvests the goods so it is important that they are empowered. I agree that this kind of supply chain will really strengthen the coffee industry and help investors and stakeholders to achieve more success. I just read your story and looked at video "Improving Farmer Livelihoods". I was deeply touched. No one on this earth shall ever say again, that change is not possible!